The holidays are always a time for happiness and celebration, or at least they should be. There are lots of ways to help achieve that and make them truly memorable and enjoyable, and of course – the most important ways are not materialistic in nature. However, that doesn’t mean that you can’t also give your family, friends, and home some actually pleasant experiences using a holiday light projector spotlight. These devices are made with the full intention of bringing light and happiness to your life, both during the holidays and during any personal events and celebrations. Whether you are looking for nice all-white snowflakes and snowfall light show or a colorful Christmas display of Santa, his sled and the reindeers, a good holiday light projector can help you out. Or, maybe you want it to also have Halloween lights such as skeletons, pumpkins, and witches for next year, as well as Easter eggs and bunnies for the spring? A good and richly diverse holiday spotlight projector should also have lights and slides for personal occasions such as birthdays, work promotions, anniversaries, and others. How do you find a holiday lights projector that can do all that, however? One that offers a lot of functionalities such as timer and memory options, one that is waterproof, durable and resistant to all kinds of weather, but at the same time is easy and simple to install? One that will fit perfectly in your yard and will light up your walls in the best possible way but that can also be used indoors at the same time? Choosing the perfect device can be challenging and quite subjective, and if you do it close to the holidays it can also ruin your fun with all the research that you’ll need to do. That’s why we thought we’d help you out at least a little bit with a quick list and guide article. Below, you will find both a Top 3 and a Top 10 lists of the best holiday light projector spotlights on the market right now. We’ve made sure that the Top 3 takes quite a detailed look at the best products you should consider, but the rest of the Top 10 also features a quick look at the products, what’s great about them, as well as what kept them away from the main three positions. After the product lists, there are also several guide sections that will walk you through the inside and outs of holiday light projectors, what’s great about them, what’s not so great about them, how to use them in the most effective manner, how to choose and buy the most suitable item for your home, and much more. So, without further ado, let’s delve straight into our Top 3 list of the best holiday light projector spotlights. Looking for a light projector to decorate your home for the holidays with? Then check out this snowflake projector one by ALOVECO. Whether you are looking for the best Halloween projector or the best Christmas light projector, ALOVECO should always be one of the first brands to check out. Their Tunnkit 14 switchable slides/pattern lights for an outdoor light projector come in all kinds, shapes, and sizes. 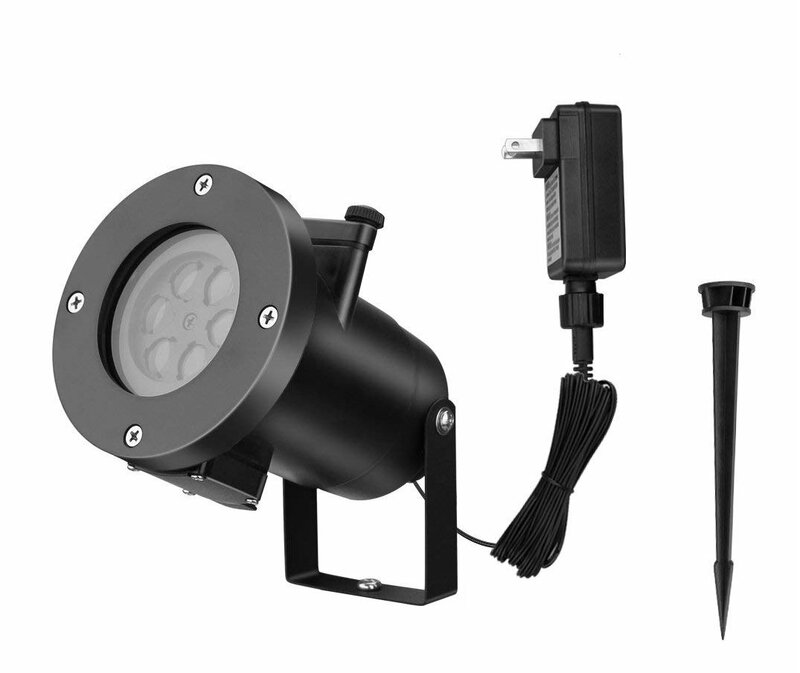 Some of the specifics that make these ALOVECO lights some of the best holiday light projector lights on the market are the fact that they are exceptionally easy to install, as well as the fact that they are waterproof and very safe to use. This year also sees the first in its kind ALOVECO stunning Christmas projector lights that beautifully simulate both snowflakes and snowfall at the same time. This gorgeous effect o of these lights is a big reason why they are among the best LED projector lights on the market. Together with their beautiful design, you will also get a wireless remote controller that will allow you to control the projector’s functions from 10 meters of distance. You will also be able to change the rotation modes, plus the remote has a timer function and a memory function. To make matters even better, with these ALOVECO Christmas Light Projector Lights you can also deck the interior of your home with these chic snowflake projector lights. What’s more, all this comes to you with an 18-months manufacturer warranty. 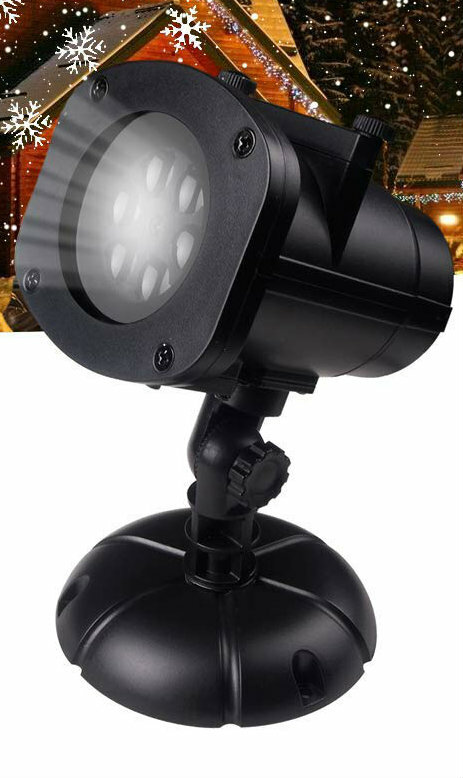 This outdoor Christmas light projector is waterproof and comes with an 8-meter cord, making it very easy and safe to install outdoors. The ALOVECO LED light projector comes with a useful remote control that has a range of 10 meters and offers several different options, including a timer function and a memory function. This outdoor holiday projector creates a beautiful mix of snowflakes and a snowfall that form a gorgeous picture and make this ALOVECO product one of the best Christmas projector items on the market. The ALOVECO LED projector Christmas lights comes with an 18-month warranty. The projector itself is smaller than the photos would suggest. The projector is more expensive than other, similar-sized products. In the market for a light that can be used on both Christmas and Halloween? Then look no further than this holiday LED light from Tunnkit. Next on our “Best LED projector” list are these outdoor Halloween projector and Christmas projector Tunnkit Holiday LED lights. They offer an all year round lights and entertainment and are great both as a Halloween ghost projector, as well as a Christmas snowflakes projector. The projector is very easy to install as it takes just a few minutes to set up properly. Plug and play is all that’s required to bring your home some of the best Halloween projector and Christmas projector experience. This makes it perfect for the decoration of an outdoor garden, lawn, house, etc. The projector comes with 16 switchable pictures and pattern slide lens. There are heart shapes, snowflakes, high heels, clovers, skeletons, maple leaves, pigeons, Santas, Christmas trees, Easter eggs, birthday cakes, stars, and a butterfly – great for every holiday. What’s best is that all these come in a myriad of colors instead of the old and worn out black & white. Of course, the projector is also waterproof and can withstand all kinds of weather. It also with a 32 foot (10 meters) long cable for an even easier and more convenient installation. The LED beads are energy-saving and come with 6W high brightness. The Tunnkit Holiday LED Projector Lights have 16 switchable pictures and pattern slide lens. All the patterns projected by this product are coloured and not black & white. The Tunnkit Holiday LED Projector Lights are waterproof and come with a 32 foot long cable. This lights projector doesn’t come with a remote control. This unique light projector light from Acetek will not only project holiday shapes but also a unique wave pattern that will make your home look even more unique. Another candidate for the title of “best holiday projector” are these Acetek Christmas Projector Lights. They offer a 2 in 1 experience thanks to their moving patterns and their water ripple effect. With this outdoor Christmas projector you can project a total of 12 different slides onto your home’s walls for a lot of holiday diversity and entertainment. What’s more, the 12 slide patterns include a total of 10 different colours in them which really helps to bring the whole holiday atmosphere up a notch. 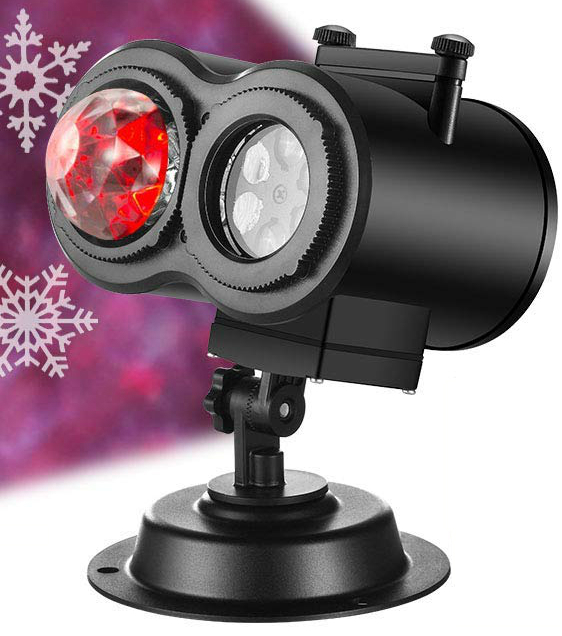 These Christmas light projector lights from Acetek also come with a remote control that has a range of up to 40 feet. With this remote control you will be able to switch up the different slides and color patterns, change between the 2 different speed modes, set several different timer settings, or choose between the 3 different flashing speed choice modes. Of course, this LED holiday projector with motion is waterproof, but what’s also worth mentioning is that it can be installed in different ways. You can either install it on the included long stake to give it some height or place it on a rounded stand to keep it close to the ground in your garden or yard. For the best possible results, place the projector at 10 to 15 feet from the surface on which you want it to shine. 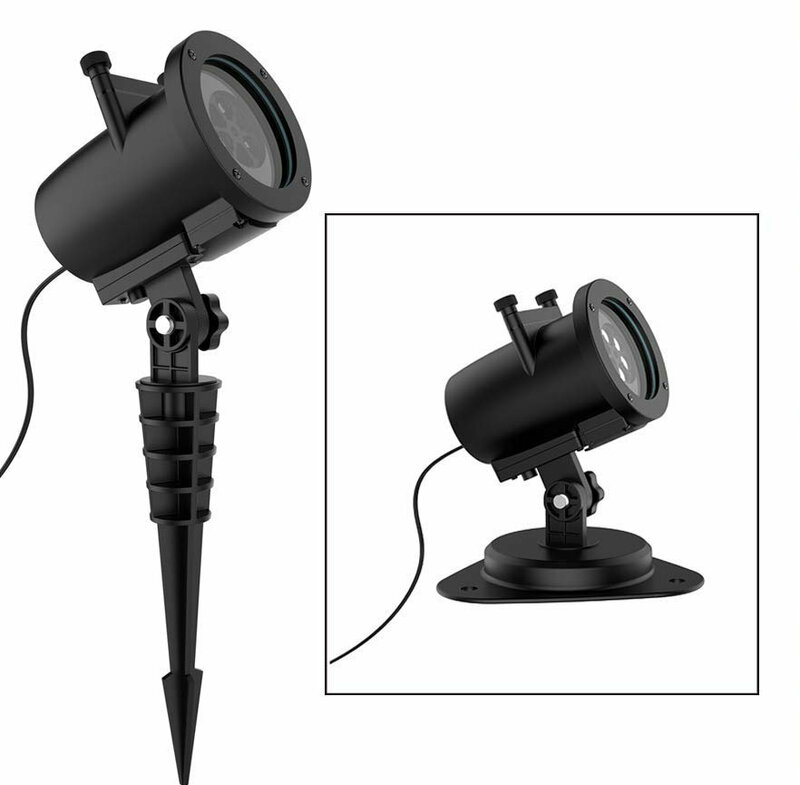 The landscape lights themselves are CE, ROHS safety certified and can be placed anywhere, both outdoors and indoors. These spotlight Christmas lights are great for much more than just the winter holidays and can work great as Halloween projection lights, as snowflake projector lights or as any outdoor holiday light projector lights. The Christmas Projector Lightscome with a versatile remote control that has up to 40 feet range and offers a lot of functionalities. This is one of the best Christmas light projector products thanks to its 2 in 1 functionality – it offers both moving patterns and a water ripple effect. This Christmas spotlight projector rotates between 12 different slide patterns and includes a total of 10 colours. The light and motion settings reset every time you turn the projector off because there is no Memory function. This means that you’ll have to manually set them every time you turn it on. Obviously, a list of just 3 products is not enough to exhaust all the great holiday light projector spotlights on the market right now. To further help you out in your choice, here are the next 7 products we feel are of the highest quality but that came just short of making the Top 3 cut. The Misika LED Christmas Projector Lights come with a film of 16 dynamic colour pattern slides and the pictures are also very easy to replace with whatever you like. These lights also come with their own remote control for an even easier access and control, however, the projector is rather small in size, which makes its applications limited. Ocean Wave Christmas Projector Lights from Enjoy Pet offer a 2 in 1 experience – 12 different and colorful moving pattern slides, as well as an Ocean Wave LED landscape. The projector is equipped with two projector heads and is waterproof and resistant to all kinds of weather. It comes with a 16.4-foot long power cable with a weather-resistant cap and a remote control with 40 feet range. One drawback this item has is that the projector has no memory functions and the color schemes you want, so it will need to be programmed every night. The Jeniulet Christmas Projector Lights for Outdoors offer 12 different pattern slides for your year-round entertainment. This makes it great for all holidays and personal occasions. Furthermore, the projector is waterproof and resistant to all kinds of weather. Its soft LED cloud protects the eyes while still offering relatively bright and clear images. Easy and fast to install, one drawback of this product is slightly overpriced for the quality of the picture that it offers. The KingKKong LED Christmas Light Projectors are great for a broad spectrum of applications. The come with 16 bright LED picture pattern slides that can fit any holiday or personal occasion. The projector also comes with a 16.5-foot long power cable and both it and the cable are waterproof, making them suitable for any situation, weather, and environment. The projector comes with a remote control, a 12-month warranty and a 30-day money-back guarantee. The projector’s coverage is smaller compared to some other products on the market, however. The Solpex Christmas Projector Lights come with 16 moving pattern slides of bright and colourful images. Great for all holidays and personal occasions, this projector can serve you all year round. It can be installed both indoors and outdoors, and it comes with a wireless RF controller that has about 50 feet of range. The projector comes with a 12-month manufacturer warranty and is very easy to install, however, it is rather small. The classic Vansky LED Christmas Projector Lights come with a wireless remote control for easy control from up to 32 feet of distance, as well as a set of 15 colourful pattern slides that can accommodate for any holiday or personal occasion. The projector itself is waterproof and works best at 16 – 26 feet of distance in a dark environment. It comes with a 45-day money-back guarantee and a 1-year warranty, however, a lot of customers report the control options to be a bit lacking. Last but not least, the Lighting Store Diret Christmas and Halloween Projector Lights offer 16 colourful all-season pattern slides. The projector is very simple and easy to install and is also waterproof so you can set it up wherever and whenever you want. It has multiple operation modes that are easy to switch between from the unit itself, plus it also has a remote control with 50 feet of range. What kept this projector out of the Top 3 was the fact that there are other projectors on the market that are a tad brighter. 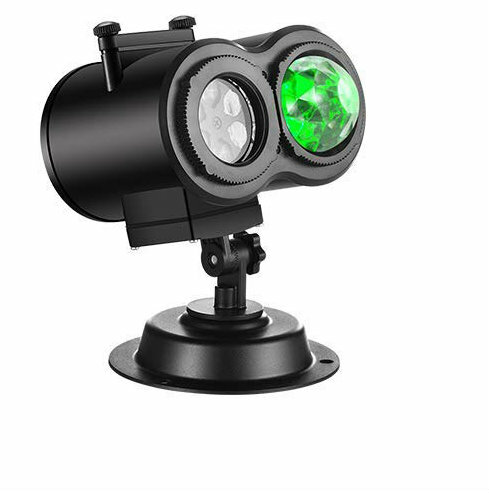 Holiday light projector spotlights are not really the most complex tech products on the market. In their simplest form, they are just laser or LED lights in a projector that you can point at a wall. A holiday light projector can easily be just a white lamp with a snowflake shaped pattern on it for ~10 pounds. Alternatively, a holiday spotlight projector can also have several lasers in it with different colours, a beam combiner between them and the laser apertures, a “sled” unit to keep the lights changing, motorised optics, a primary heat sink to keep the projector in a good condition under all weather circumstances, a temperature sensor to monitor for thermal shutdown. All this can be accompanied by a remote control and a ton of additional functionalities such as a turn off the timer, memory functions and much more. There can also be a sound device that may be able to play holiday jingles if that’s what you want for your yard. Choosing between a holiday lights projector with more or fewer options and functionalities is entirely subjective and personal, and we’ll go over that process in the next section of this article. However you choose to process, these are the basic components of a lights projector. So, why did holiday light projectors become so popular over the past couple of decades? It used to be that people decorated their homes with actual string lights and lamps, as well as with other physical decorations such as plastic snowmen or reindeers with lights in them, and so on. Well, while such decorations are still used by many homeowners, holiday light projector spotlights offer a much simpler and easier way to light up your house in a beautiful display of holiday spirit. They are quicker and easier to install, they are much cheaper overall – both in their initial price and in their energy consumption, they are easier to maintain, and what’s more, they can also work in different holidays or occasions. While it’s silly to hang up your Christmas lights on Halloween or on your birthday, you can easily start up your light projector and load some birthday or Halloween patterns in it to match the holiday. 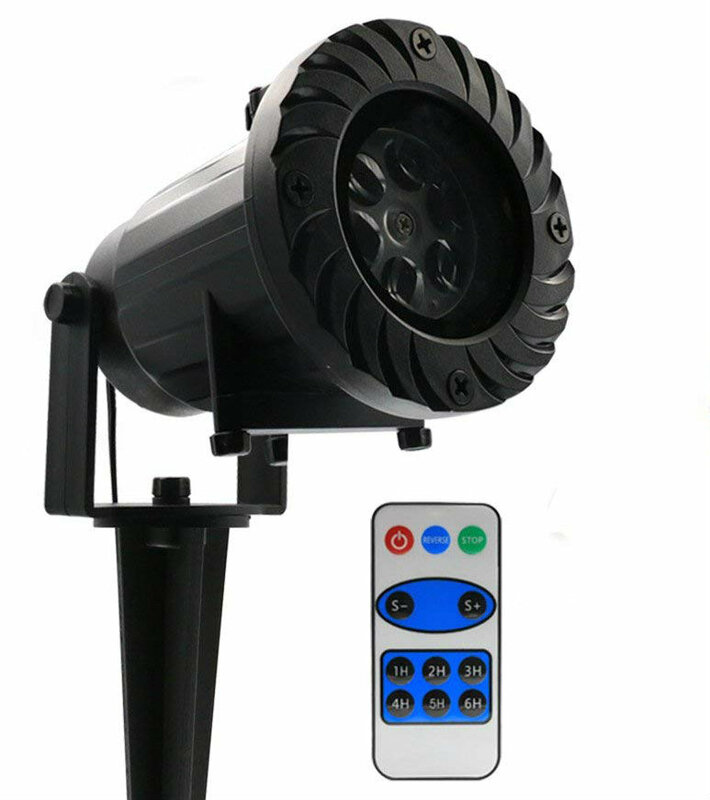 Holiday light projectors are also more durable and handle tough weather better, they can often be easily operated with just a single remote control, and they can easily be relocated at a moment’s notice. All these factors make holiday light projector spotlights one of the best ways to lighten up your home for the holidays, as well as one of the best purchases you can make for an year-long use. Purchasing the right holiday light projector for your home and family can be either a joyful or an infuriating task, depending on how it goes. It can either be something that happens quickly and leads to an amazing purchase, or, it can take you a ton of time and still lead to the purchase of a product that simply isn’t right for your home and situation. To make sure the latter doesn’t come to past, let’s take a look at the main steps to take when you are looking for your next holiday light projector spotlight. First, of course, there is the “quality” question. Regardless of what size or type of a holiday light projector you choose for your home, the one constant that applies to all customers and situations is that it needs to be of a high enough quality. Holiday light projectors are luxury items after all, so there is no point in wasting money on one that will not give you the experience you are looking for. A holiday light projector needs to be bright and offer vivid and precise colors and schemes. If Santa or the snowflakes are all fuzzy and barely distinguishable then you might as well not have them on your home’s walls. The holiday lights projector you should be looking for is one that can give you bright and clear light images. What’s more, the best holiday light projectors are also durable, waterproof and will last you for multiple seasons. The last thing you want from such a device is to have to buy a new one every year. A high-quality holiday spotlight projector should also have at least several of the basic functionalities such as a timer, a memory function, and so on, as well as a remote control to operate it with. How do you make sure that the projector you are looking at is actually of a good quality, however? After all, every manufacturer says that their products are durable, waterproof and resistant to all kinds of weather. They all claim that their holiday light projectors offer bright and clear images, as well as that they are easy and simple to install and use. Even if you just look at the promotional images they use, it is funny how pompous a lot of them are – a single, small projector lighting an entire 2-story house top to bottom? Yeah, that doesn’t happen. To find a truly good holiday light projector we are usually forced to rely on the good old customer reviews. Or the “bad old” – depending on how you view them. Customer reviews are far from the perfect tool to use when it’s time to make a decision – they are often too subjective, they don’t offer enough details, they usually fail to mention or realize how the customers themselves have made mistakes during the installation, and they often fail to account for the fact that there is a difference between a holiday light not being suitable for a specific situation and it not being “good enough”. However, as long as you are aware of all these things when reading customer reviews, and as long as you make sure to read a lot of them, you can soon start getting a clear picture about how good a product is. Simply put, as subjective and incomplete as customer reviews tend to be, if too many of them are saying the same thing, chances are that there is some truth there. In addition to customer reviews, you can also give a fair bit of attention to professional industry reviews. These review texts are usually in the form of large, long-form articles and can be quite informative. They try to look at the products’ qualities objectively and to give you a good insight into what they really are. These reviews can sometimes be biased, however, so it’s important to take them with a grain of salt, but they can also be of use. Lastly, when looking for quality, taking a quick look at the brands of the products you are choosing between is also a good thing to do. Brands don’t mean everything when it comes to holiday light projector spotlights – there are famous brands that produce subpar products, as well as brands that no one has heard of that actually make great products. Still, the general rule of thumb here is that if a brand has a good reputation, it’s usually deserving of it. To get you started, here are some of the top brands we’d recommend keeping an eye on: Vansky, Solpex, Tunnkit, Lighting Store Diret, ALOVECO, Misika, KingKKong, Jeniulet, Enjoy Pet, Acetek, and others. How to get a holiday lights projector that reflects your personal preferences and situational needs? What’s the product’s ideal work distance? Some light projectors say they work best at 5 – 10 feet of distance, while others state that they operate optimally at 20 – 25 feet or more. Instinctively, people tend to view the latter as somehow “better” than the former, as if the greater distance means greater quality. That’s not necessarily true, of course. The greater distance usually means that the projector is capable of projecting a larger light show or image on your walls, but whether that’s good or bad depends on your wall and your preferences. Smaller projectors with shorter distances are better suited for smaller yards, as well as for indoor use if you want to put them in your living room every once in a while. Do you want a color-rich holiday light projector or a black & white one? Colourfulness is also often cited as a positive, but the fact of the matter is that a lot of people want simply a good old black & white snowfall display. And when you add to that the fact that a lot of colorful light projector spotlights lack the functionality to switch up their color schemes, you may very well end up being forced to light colorful images on your wall even if you don’t want to. What kinds of options do you want? Having an abundance of options, settings and functionalities are generally considered a good thing, but there is such a thing as unnecessarily many options and functionalities. After all, if you don’t intend to ever use a certain function and its existence in a product inflates its price – you don’t want that product. There are some holiday light project spotlight functions that are more or less always useful such as the memory function or a timer. However, even they may not be necessary for you. There are a lot of customers that don’t even need a remote control when using a light projector, so paying an extra 10% – 15% on a product just because it has a remote control may simply not be worth it for you. What kind of/how many pattern slides do you want your holiday lights projector to have? If you only intend to use your lights projector for one or two holidays per year, then chances are that you don’t need it to have 20 pattern slides, especially since a lot of projectors always rotate their slides and don’t have the option to hold still on a single one. If, however, you want to have the option to switch it up, then the more slides you have at your disposal, the better. Plus, while most holiday light projectors have things such as snowflakes, Christmas trees, Santa Claus pictures, stars, Easter eggs, Halloween pumpkins, and so on, it is worth mentioning that they can all look differently, so remember to take a good look at the projections themselves and choose ones that you’ll fancy looking at. How do you plan to install your holiday lights projector spotlight? Do you want to mount it on a high stake, or would you rather place it on a low-standing platform? Do you want it to rotate or not? Different light projectors come with different installation equipment, with some giving you the option between several different ways to install the device. Consider how you’re planning to place the projector in your yard or home and choose a projector that offers that option. Do you want a light projector that uses LED lights or once that works with lasers? The main difference is the clarity – lasers generally produce a greater clarity, while LED projectors result in softer images. Simply put, lasers tend to be better for snowflakes, while LED projectors make for great snowfall scenes. Our own general rule of thumb for every life situation is “lasers are cool”. Do you want your holiday light projector to also play music? Some products have the functionality of playing holiday jingles as they work which might be something you’d like. IF not, however, there is no point in paying for a higher-priced product with functionalities you won’t use. Consider the power efficiency of your lights projector as well. As with most tech products, a lot of customers tend to ignore the electricity consumption that they bring to the table. They tend to feel insignificant when it comes to the bulk price you pay for the product itself, but that’s generally a bad tactic. An electric item that you intend to keep working for hours at a time each day, multiple days per season/year can consume a lot of electricity and quickly compensate for its higher or lower price. Consider the price. Lastly, different people have different budgetary capabilities and concerns, so make sure you are not paying more than you are comfortable with. Holiday light projector spotlights are just luxury items after all, so while there is no point buying a subpar luxury item, there is also no point in breaking the bank for one. Laser light is much more focus and precise than LED light. Where a laser produces a single dot on your wall, a LED light will produce a wide circle. This is a point for lasers if you want to project clear and precise images, but it can also be viewed as a point for LED lights if you just want to project one big, fuzzy light scene on your wall, such as a general snowfall scene. Simply put – this is more a matter of personal preferences. Lasers also offer increased brightness. Because their light is so much more concentrated, it is also brighter, without consuming any extra energy. Lasers tend to have a longer lifespan on average. Of course, this depends greatly on each individual product’s quality, as well as on how you use them, but on average, lasers tend to outlast LED lights. Lasers actually have a lower power consumption. Again, this can vary depending on each individual product’s specifications, but lasers tend to be the more power-conserving option. On the flip side, laser holiday light projectors tend to be more expensive in terms of their direct purchase prices. LED lights, thanks to their simpler design and functionalities can be cheaper to purchase which is a great draw for a lot of customers. In total, however, laser lights offer a lower total cost of ownership (TCO). Regardless of the fact that their initial price is often higher, the longer lifespan of lasers, coupled with their lower energy consumption means that they will usually cost you less money over the years. So, as you can see, most of these factors tend to line in favor of lasers. Still, these benefits come at a higher initial price and in the form of a more complex product, which a lot of homeowners tend not to like. Either way, it’s important to choose carefully between LED and lasers so that you can get suits your needs in the best possible way. Using a holiday light projector spotlight is all about proper placement and good management. To achieve the best results and the richest holiday atmosphere you will need to make sure that you place the device in the perfect spot and the perfect distance from the surface on which you’ll project its lights. Each individual light projector has its own specifics that you’ll need to take into account, so always follow the instructions carefully. It is not uncommon for customers to not place their light projectors properly and then blame the bad results on the product itself. Additionally, consider the light projector’s safety and longevity as well. Holiday spotlights are not the most expensive items on the market, but there’s no point in buying a new one every Christmas. 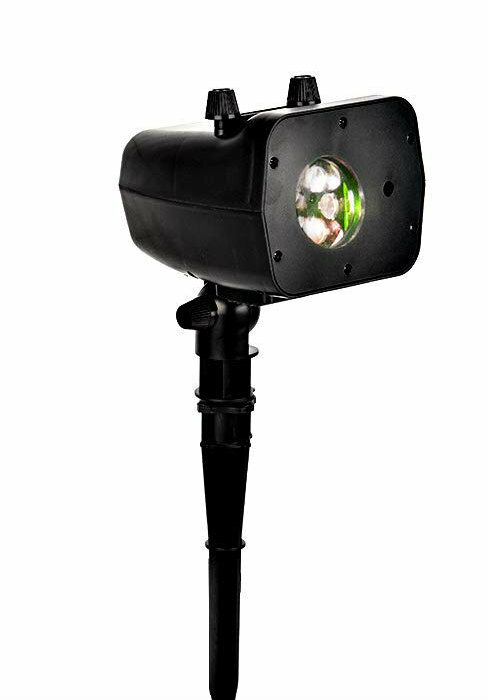 Most light projector lights are waterproof as they are expected to have to work outdoors, and they do have a relatively well-reinforced body that can withstand a certain amount of wind and heavy weather. Still, regardless of what kind of holiday light projector you are using, there is no point in leaving the device outside for longer than you need to. Sure, it’s annoying to have to frequently take it back inside and then reinstall it again next week or next month, but if you are not going to use your projector for a while (even just for several days), it makes sense to save it the weather exposure during that time. Most light projectors are made to be very easy to install, so while it may be annoying, the whole process shouldn’t really be that time-consuming. Also, remember to use the timer functionality. There is no point in leaving your lights projector engulfing your home in lights at 3 am when no one will be around to observe it. Lights projectors generally don’t run on batteries, but it’s still unnecessary to waste the electricity and overuse the projector when you don’t need it. Additionally, your neighbors will likely not be happy if there are lasers glowing in front of their windows in the middle of the night. And remember to consider the type of lighting you are using. Laser lights can be even more annoying for your neighbors because they are brighter, however, LED lights consume more electricity and tend to be used for wider images. In both ways, it is typically smart to turn them off during the smaller hours of the night, but it can depend on the specific lights and the situation you’re using them in. If you are using your holiday light projector spotlight adequately and efficiently, it can last you for years and over dozens of hundreds of different holidays. If you misuse it, on the other hand, it can be a “one and done” type of product that will only do a subpar job for one holiday season. As you can see, there is a great diversity when it comes to holiday light projector spotlights. They can vary a lot in size, in brightness, in the shapes and pictures they come with, in the size of the projections themselves, in the color schemes they use, in their installation and setup, in their remote functionalities and other quality-of-life functions, and so on. Choosing the right holiday lights projector depends largely on what you and your home need but it is also a question of finding the best quality. A subpar lights projector simply won’t be able to give you the experience you are looking for and can outright ruin the mood in your home or at your gatherings. Diversity is also an important consideration, because you likely don’t want to spend money on a projector that will only be useful for one month of the year – instead, finding a lights projector that can serve for many different holidays and even personal occasions is a great way to keep things interesting and spirited all year round. Another crucial thing to consider is whether you want a laser-powered lights projector or one with LED lights. Both have their advantages and disadvantages, ranging from the clarity of the lights, through power efficiency, to initial product cost. However, at the end of the day, it all boils down to personal preferences – if you want clearer images and a lower energy consumption, laser lights are usually the way to go. If, however, you want a lower initial price, as well as product simplicity and a more scattered, larger-surface light LED, may be the way to go. As with most technology item, however, the range of options and functionalities your holiday lights projector offers is probably one of the most important features to look out for. A lack of important quality-of-life functionalities can ruin your experience with a lights projector and thus – a large portion of your holiday experience. Things such as a memory function so that you don’t have to set up your preferred light schemes every single evening, a timer function so that your spotlight projector turns off when you need it to, and others, are all great things to have in your holiday lights projector. Hopefully, our quick article has helped you at least a little bit in your search for the best holiday spotlight projector and thus – we’ve helped you bring a little more light and spirit into your holiday experience! To wrap things up, here. 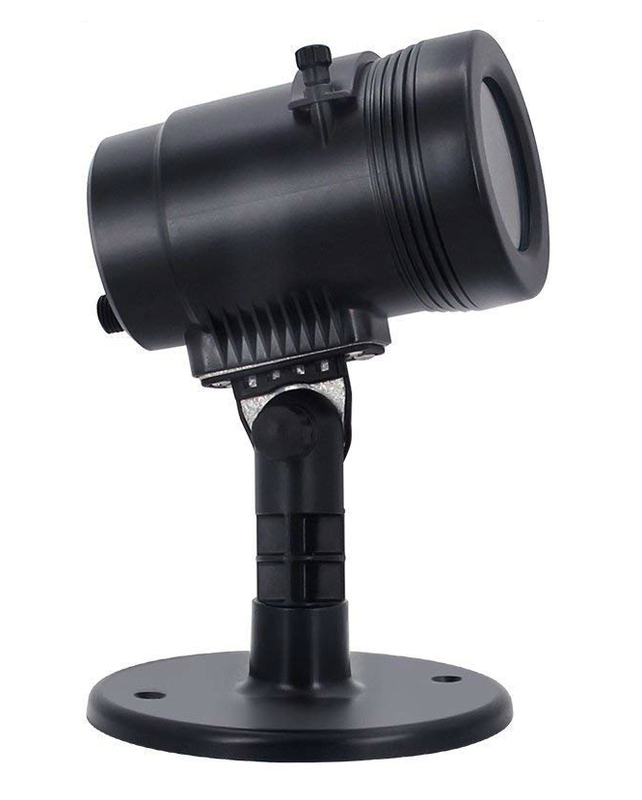 The ALOVECO Christmas Light Projector Lights is one of the best light show projector products on the market. It creates a beautiful light show of both snowflakes and a snowstorm at the same time, resulting in a great holiday winter house light projector show. 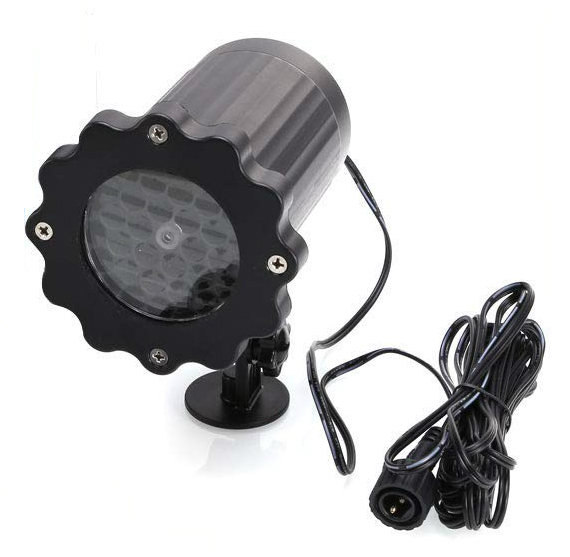 What also makes this one of the best outdoor light projector items is the fact that it is 100% waterproof, it comes with an 8 meters long power cable, as well as an 18-months manufacturer warranty. The Tunnkit Holiday LED Projector Lights offer a great year-round experience for all holidays – Christmas, birthdays, Easter, Halloween, Valentine’s Day, and many others. This is achieved thanks to the 16 switchable pictures and pattern slide lens that are also colored in various different bright and joyful colors. The projector is also waterproof and comes with a 32-foot long cable for your convenience. You can use this both indoors and outdoors and set it up wherever you like. The Acetek Christmas Projector Lights is one of the best holiday light projector products thanks to its versatility. It offers a 2 in 1 experience with its moving patterns and its water ripple effect. It also rotates between 12 different slide patterns and includes a total of 12 different colors. 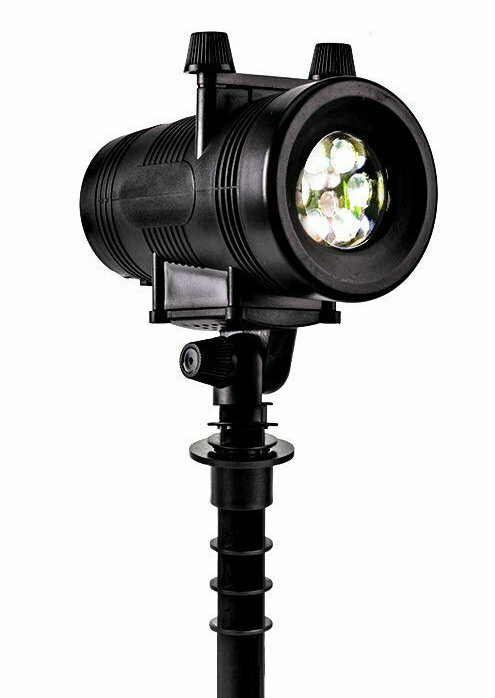 These Acetek ghost projector lights also come with a 12 months warranty and a useful remote control that has up to 40 feet range and offers a ton of functionalities.